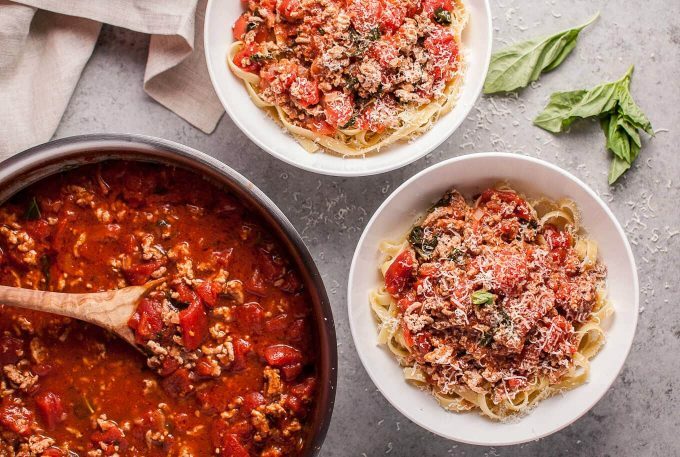 This easy 20 minute turkey bolognese recipe is a quick and healthy pasta sauce that also makes great leftovers! This ground turkey pasta makes an excellent weeknight dinner that the whole family will love! I love making a big batch of my spaghetti sauce when I have a few hours to spare, but that isn’t always possible. 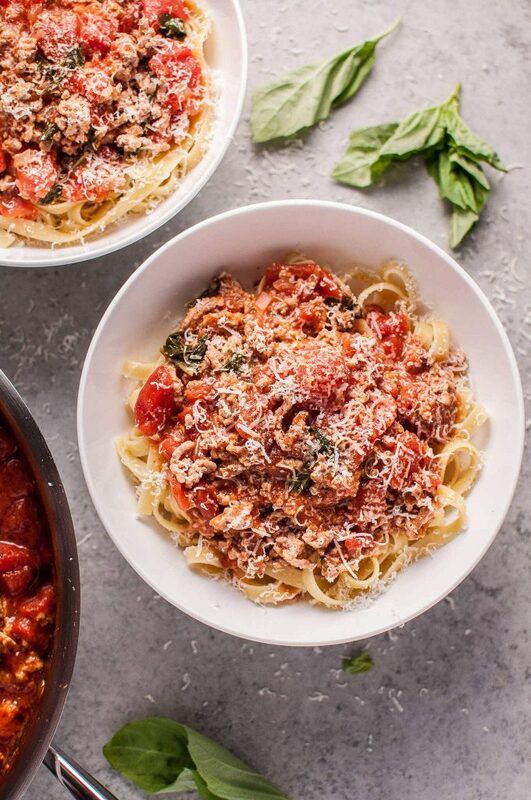 You can have a healthy and delicious homemade tomato and meat sauce ready in less than half an hour and without any fussy ingredients. A little bit of fresh parmesan cheese grated on top and you’ve got yourself one tasty meal! Sauté the onion in a skillet until softened; add the ground turkey and brown it. Add the other sauce ingredients and simmer for 10 minutes. Super easy! I can’t believe it’s almost October. It’s scary how fast time flies. I don’t like cold weather, but I do have sports to console me at least. Football season is well underway, and my Broncos are undefeated. Hockey season will begin soon, and I am excited to check out my Oilers’ new arena. So far we have tickets to December and March games, and we may buy another game or two from another season ticket holder friend. I’m cautiously optimistic that they’ll do better this year… but it has been a looong 10 years of not making the playoffs. I’ve been brainstorming lots of cozy recipes to make and share with you in the coming months, and I’m pretty excited about them! If you have any suggestions of what kinds of things you’d like to see on here, I’d be happy to hear them. I hope you will enjoy this ground turkey pasta recipe! This easy 20 minute turkey bolognese is a light and tasty ground turkey pasta dish that also makes great leftovers! Add the olive oil and onion to a skillet and sauté on medium heat for 5 minutes. Add the turkey to the pan and cook for another 5 minutes, stirring occasionally. Add the canned tomatoes, Italian seasoning, garlic, and basil. Increase the heat to medium high. Once it starts to bubble, reduce the heat to medium and let it simmer for 10 minutes. Season with salt & pepper. Serve with pasta and freshly grated parmesan cheese. You may also like my creamy leftover turkey pasta recipe. This looks so incredibly delicious! I’m absolutely dying to dig into that bowl and I love how quick and simple it is to make.